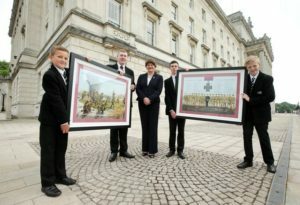 First Minister Arlene Foster is pictured Tom Crowther and Henry Hempstead from Campbell College and Jack Robinson and Dylan Bowden Royal Belfast Academical Institution. Two posters – one of Ulster’s V.C. 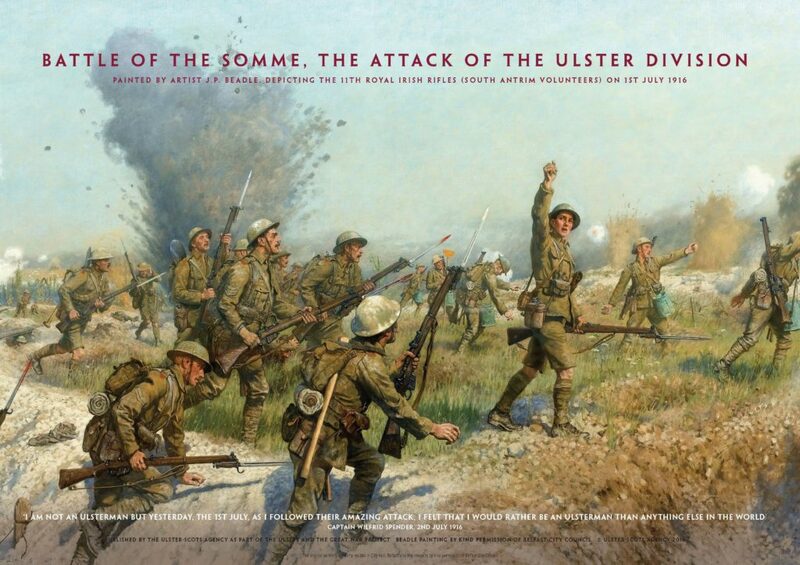 Winners and one of the famous James Princep Beadle painting of the 36th Ulster Division – have been supplied to schools across the nine counties of Ulster. 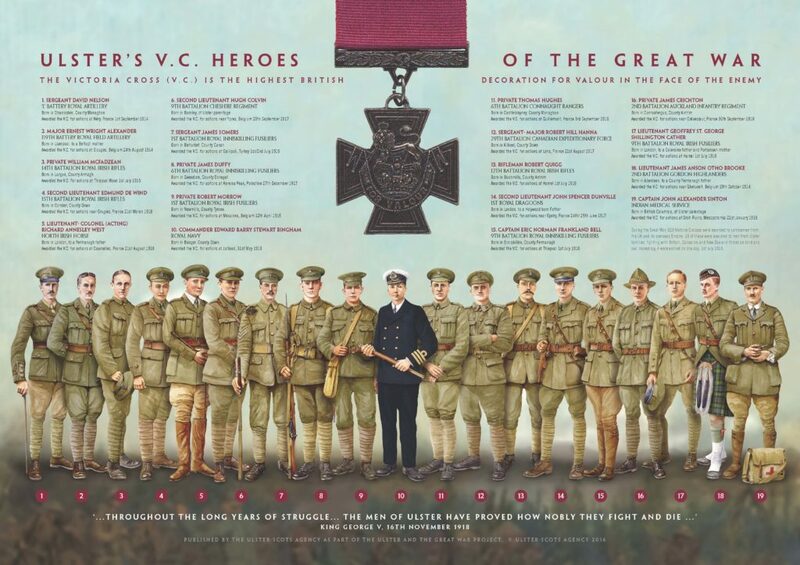 Portrait images of the V.C winners were of poor quality and so a complete, stylistically consistent, set of illustrations was commission to show the men in full uniform. 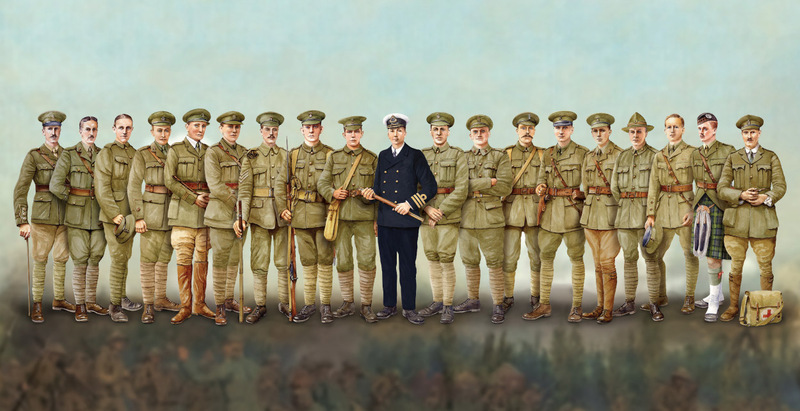 Working with an expert illustrator and a military historian, these are the most authentic depictions of the servicemen. The men themselves came from Donegal, Cavan and Monaghan, as well as the counties of present-day Northern Ireland. Some were born in England of Ulster parentage. A brief description is given of each man’s place of birth, and of the act of bravery which caused them to be awarded the Victoria Cross. We are delighted that Belfast City Council granted permission for the Beadle painting to be reproduced, incorporating the famous quote from Captain Wilfrid Spender: “‘I am not an Ulsterman but yesterday, the 1st July, as I followed their amazing attack, I felt that I would rather be an Ulsterman than anything else in the world”. The original painting currently resides in City Hall, Belfast.